As the first Monday in October rapidly approaches, you may be wondering: how am I going to find time to keep up with the Supremes this year, when I’m already up to my neck with the financial crisis, the election, and, oh yeah, my actual work? As usual, your library can help. The HLS Library subscribes to the excellent “U.S. 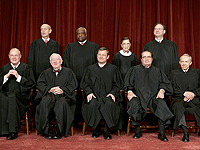 Law Week: Supreme Court Today.” Supreme Court Today offers synopses of upcoming cases, an update on the most recent actions the Court has taken, an up-to-date oral argument schedule, lists of cases granted review, and lots more useful information. Plus it’s searchable. You can also sign up for alerts from either U.S. Law Week, Supreme Court Today, or many other BNA publications. << Stop Them Before They Innovate Again!